IAF Wing Commander Abhinandan Varthaman was captured by Pakistani military on 27 February after his MiG-21 jet was shot down in PoK. 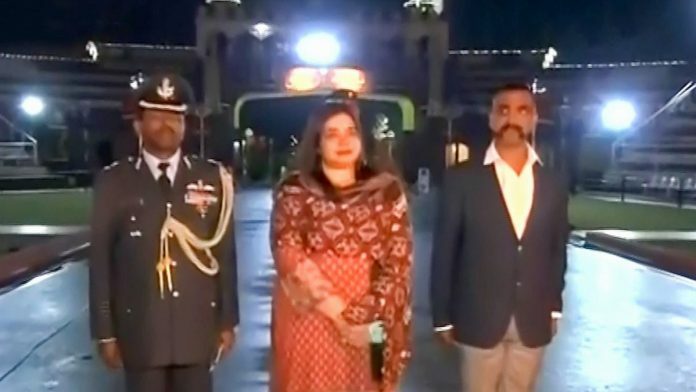 New Delhi: Indian Air Force (IAF) pilot Wing Commander Abhinandan Varthaman returned to India via the Wagah-Attari border after two days in Pakistani captivity. The IAF pilot crossed over at 9.22pm. Abhinandan, who was flying a MiG-21 Bison aircraft when he was shot down, was first sent to Islamabad from Rawalpindi, which is the general headquarters of the Pakistani Army. He was then brought to Wagah late in the evening and handed over to officials from the Indian High Commission in Pakistan. Abhinandan, who will be taken to Delhi immediately, is being brought back by Group Captain J.D. Kurien, India’s Air Attache To Pakistan. The IAF pilot’s parents are at Wagah to receive him. Pakistan Prime Minister Imran Khan had said Thursday that Islamabad would be releasing the IAF pilot as a “gesture of peace” with India. This came a day after India issued a strong demarche to the acting High Commissioner of Pakistan to India and told him that there will be no “deal or negotiation” on handing over Abhinandan and that he should be returned to India “unharmed”. Abhinandan had landed in Pakistan-occupied Kashmir after the MiG-21 Bison he was flying during the dogfight was shot down by the Pakistanis who had breached the Line of Control and attacked military installations in Jammu & Kashmir. He was then beaten up by some locals, as suggested by purported footage of his first moments on Pakistani soil, before being rescued by the country’s army. This report has been updated to accurately say that Wing Commander Abhinandan Varthaman was handed over at Wagah, not Islamabad. All those who worked behind the scenes to secure this auspicious outcome deserve our gratitude.